Wilmer's favorite pastime is working on his Jeep…he began teaching himself mechanic skills when he was 16 years old, mostly by experimenting and taking things apart...He grew up idolizing fellow Venezuelan Andrés Galarraga...Wilmer credits the Rays and pitching coach Kyle Snyder with making him feel comfortable-specifically allowing him to move back to the third base side of the rubber after struggling from the first base side previously...His favorite food is arepas-baked cornmeal patties sometimes stuffed with cheese or meat- and chicken with rice. Made the Dodgers Opening Day roster and made 6 apps for them…designated for assignment on April 23 and traded to the Athletics for minor league lefthander Logan Salow…made 4 apps for the A's, designated for assignment on May 23 and traded to the Rays for minor league righthander Peter Bayer on May 25...Went 2-1 with a 1.67 ERA (27-IP, 5-ER) in 9 apps (5 starts) with the Rays, compared to 0-2 with a 12.71 ERA in 10 apps before the trade…yielded at least 1 run in eight of 10 apps prior to the trade...His first 4 starts came in designated bullpen day games, pitching deeper and throwing more pitches in each successive start…was officially named by Manager Kevin Cash to the starting rotation on June 26, but pitched only once more before a season-ending injury...Between the three organizations, yielded 12 HR in 44 IP for a 2.45 HR/9 IP ratio…allowed 2 HR in 27 IP with the Rays, both solo shots, and only 1 HR in his last 23.1 IP…yielded 10 HR in 17 IP, including multiple homers in 3 apps, before the trade…23 of his 29 runs allowed came via the home run...On June 8 vs. SEA, made his first career start and finished with 5 SO in 2.1 IP…retired his first 6 BF on 15 pitches in the 1st inning and 15 pitches in the 2nd, but allowed a walk, single and Dan Vogelbach RBI single to start the 3rd, got a final strikeout and was replaced by Matt Andriese, who allowed 1 IR to score...On June 23 vs. NYY, went 5.2 IP, the longest outing of his career, and recorded his first career win in his 26th app (4th start) in the majors… his first win came 2,104 days after he made his major league debut on Sep 18, 2012 at LAA (with TEX)…did not allow a run in 5.2 IP, the longest scoreless start by a Rays pitcher against the Yankees since Jake Odorizzi (6.2 IP) on July 29, 2016 at home...On June 29 vs. HOU, did not allow a hit until Max Stassi's 2-out double in the 5th inning, and his only run allowed came after he left the game on Alex Bregman's 2-run homer in the 6th…left the game with a right lat strain, was placed on the disabled list the next day and missed the rest of the season. Saw his first big league action since 2013, after having his contract selected on Sept. 2 and making his Dodger debut on the same day...allowed seven runs in 3.2 innings of relief (17.18 ERA) with three strikeouts in three games with Los Angeles...Spent majority of the season with Triple-A Oklahoma City, going 10-8 with a 3.42 ERA and holding hitters to a .222 average in 25 starts...went 7-3 with a 2.36 ERA in 12 home starts and struck out 94 batters against 14 walks in 68.2 innings...Named Pacific Coast League's Pitcher of the Year after leading the league in ERA, WHIP (1.11), opponents' batting average and strikeouts (178), while also ranking among the best in starts (T-2nd), wins (T-3rd) and innings pitched (134.1 IP, 6th)...his strikeout total was Oklahoma City's all-time single-season strikeout record, since the team rejoined the PCL in 1998...Was also selected to the All-PCL team, mid- and post-season PCL All-Star and was named PCL Pitcher of the Week twice, taking home the award for the periods of May 15-21 and July 10-16 in 2017...also honored as Baseball America's Triple-A All-Star. Split the season between Toronto's Triple-A Buffalo and Double-A New Hampshire, where he owned a combined 4-4 record over 12 games (11 starts) with a 3.68 ERA (27 ER/66.0 IP)...Combined to strike out 55 batters against 12 walks in 66.0 innings, posting a 4.58 strikeout-to-walk ratio...held the opposition to a .244 average and posted a 1.11 WHIP...Earned the Eastern League Pitcher of the Week for the week ending August 21. Pitched for the Ottawa Champions in the Canadian-American Association of Professional Baseball, going 10-4 with a 4.09 ERA in 21 games (20 starts)...struck out 81 batters against 55 walks in 116.2 innings. Pitched for the Rangers' Double-A Frisco, where he appeared in 29 games going 2-1 with a 3.48 ERA (12 ER/31.0 IP)...held the opposition to a .214 average and struck out 31 against 17 walks...Made two stints on the DL, from July 8 - Aug. 5 and again from Aug. 10 - Sept. 23 before being designated for assignment on Oct. 2. In his first full season as a reliever, combined for a 2-2 record, 14 saves, and 1.04 ERA (6 ER/52.0 IP) in 42 appearances between Frisco (AA) and Round Rock (AAA), while also making 2 appearances for Texas… recalled to Texas from Round Rock on July 11 and appeared twice in a 3-game series at DET on July 12 (1.0 IP, 0 H, 0 R, 1 BB) and July 14 (0.1 IP, 1 H, 0 R, 1 BB)…was optioned back to Round Rock on July 19…held opponents to a .127 average (22-173) between the two minor league stops…posted a 0.64 ERA (2 ER/28.0 IP) in 20 combined road appearances…was rated by Baseball America as the Rangers' no. 22 overall prospect and 2nd-best righthanded relief prospect entering the season, as well as having the organization's Best Fastball. Right-hander catapulted from High-A Myrtle Beach to Arlington with major league debut on September 18 in his first season after "Tommy John" ligament transplant surgery...combined to go 4-5 with a 4.03 ERA (44 ER/98.1 IP) in 33 games/19 starts, registering 138 strikeouts against 44 walks at the minor league level with Myrtle Beach and Double-A Frisco prior to recall from the 'Riders on September 16.TEXAS: Was recalled from Frisco upon conclusion of the RoughRiders' season on September 16...debuted 2 days later on September 18 in the 6th inning of an 11-3 loss to the Angels in Anaheim...retired 3 of 4 batters faced, permitting only a 2-out walk to Alberto Callaspo...issued walks to both batters faced in Arlington debut Sept. 26 vs. Oakland, with both runners scoring on Tanner Scheppers...tossed a scoreless 8th inning in third and final appearance on September 28 vs. the Angels, setting down Mike Trout on strikes to start the inning for his first major league strikeout...FRISCO: Promoted to Frisco on August 1 and joined the club's bullpen...recorded a strikeout in all 10 outings, including multiple strikeouts 9 times...held Texas League opponents to a .170 average (9-53) with 3 extra-base hits (2B, 3B, HR)...stranded 4 of 6 inherited runners and held opposition 0-for-12 with RISP...recorded a 6.43 ERA (5 ER/7.0 IP) over first 6 appearances before 8.0 scoreless innings with 16 strikeouts against one walk over final 4 regular season outings...compiled a 2.45 ERA (1 ER/3.2 IP) with 7 strikeouts against one walk over 3 relief appearances in the Texas League playoffs...MYRTLE BEACH: Spent bulk of the campaign in Myrtle Beach rotation... finished T7th in the league with 109 strikeouts despite more than 20.0 innings fewer than any other hurler in the top 10...registered strikeouts against 32.3% of batters faced...was 2-5 with a 4.62 ERA (39 ER/76.0 IP) and 96 strikeouts against 36 walks as a starter and tossed 7.1 scoreless, hitless innings with 13 strikeouts against one walk in 4 relief appearances...right-handed opponents batted .194 (37-191), with left-handed hitters at .206 (21-102)...opposition hit .305 (18-59) with RISP...leadoff batters were just 7-for-71 with 32 strikeouts... did not record an out in first start of the season on April 11 vs. Potomac, allowing all 6 batters faced to reach safely...completed 3.0 innings-or-less in all 4 April starts, compiling a 9.00 ERA (8 ER/8.0 IP)...went 1-1 with a 1.57 ERA (4 ER/23.0 IP) and 29 strikeouts over 5 starts in May...surrendered 7 runs over 2.2 innings of work on June 6 vs. Lynchburg before going 1-0 with a 0.86 ERA (2 ER/21.0 IP) over next 4 outings...completed a season-best 6.0 innings with one hit twice over a 4-start span from June 21-July 6... made final 3 appearances as a Pelican out of the bullpen, retiring 19 of 21 batters faced (1 HBP, 1 BB). Did not pitch as he continued to rehab from right elbowsurgery...was on minor league DL for most of the season, butwas recalled and placed on Rangers 60-day DL on Aug. 31 asthe club made room for new acquisitions Matt Treanor andMichael Gonzalez. Combined to go 5-3 with a 4.35 ERA (38 ER/78.2 IP) in 16games/starts with Hickory (Low-A) and Bakersfield (High-A) ... ended up at the High-A level just prior to his 20th birthday ... wasplaced on the disabled list on July 7 for duration of season withright elbow inflammation ... had "Tommy John" ligament transplantsurgery on his right elbow on Oct. 1, 2010 ... surgery was performedby Dr. Keith Meister at the Medical Center of Arlington ... began the year at Hickory, where he finished 2009, and went 4-1with a 5.16 ERA (17 ER/29.2 IP) in 7 games/starts...oppositionbatted .294 (35-119), .327 (17-52) by lefties and .269 (18-67) byright-handers ... threw 5.0-innings-or-less in each start ... posted 8K's in first start on April 10 at Hagerstown...promoted to Bakersfieldon May 17 and went 1-2, 3.86 (21 ER/49.0 IP) over 9 startsin his High-A debut ... Cal League opponents batted .217 (38-175),.230 (20-87) by lefties and .205 (18-88) by right-handers ... gaveup 6 runs in 2.0 innings in his High-A debut on May 20 at Modesto,while he was still 19 years old ... over final 8 starts, had a 2.87 ERA(15 ER/47.0 IP) ... tossed 7.0 shutout innings in his 2nd start onMay 26 at Inland Empire...recorded season-high 9 K's on June16 vs. Stockton (6.0 IP) ... tossed 6.0 shutout innings in lone High-A win on June 30 at Stockton ... took no decision despite qualitystart in final outing on July 5 vs. San Jose (6.0 IP, 3 R-ER) ... enteredthe season as Rangers' 10th-best prospect, according toBaseball America. Spent the entire seasonwith Hickory...entered the year ranked as the Rangers' 20th-bestprospect according to Baseball America...went 7-3, 3.59 (40ER/100.1 IP) in 24 starts and 1-0, 2.25 (2 ER/8.0 IP) over 5 reliefappearances...posted a 6.08 ERA (16 ER/23.2 IP) in the first inning compared to a 2.74 ERA (26 ER/85.1 IP) in all other innings...opened the season with 3 relief outings, then went 2-1, 4.81 (21ER/39.1 IP) over his first 11 starts and 5-2, 2.85 (19 ER/60.0 IP)over his last 13 starts. Started the campaign on the disabled list with right shoulder injury and appeared in just three games with the Rookie-level AZL Rangers in an injury-laden season...overall went 1-0 with a 10.38 ERA (5 ER/4.1 IP) and striking out six against one walk. Spent his first professional season with Rookie-level AZL Rangers where he finished the season going 2-3 with a 4.53 ERA (23 ER/45.2 IP) and 61 strikeouts against 24 walks. November 2, 2018 Tampa Bay Rays activated RHP Wilmer Font from the 60-day injured list. May 26, 2018 Tampa Bay Rays activated RHP Wilmer Font. May 25, 2018 Oakland Athletics traded RHP Wilmer Font to Tampa Bay Rays for RHP Peter Bayer. May 23, 2018 Oakland Athletics designated RHP Wilmer Font for assignment. April 26, 2018 Oakland Athletics activated RHP Wilmer Font. April 25, 2018 Los Angeles Dodgers traded RHP Wilmer Font to Oakland Athletics for LHP Logan Salow. April 23, 2018 Los Angeles Dodgers designated RHP Wilmer Font for assignment. November 2, 2017 Los Angeles Dodgers activated RHP Wilmer Font. October 6, 2017 Los Angeles Dodgers reassigned RHP Wilmer Font to the minor leagues. September 2, 2017 Los Angeles Dodgers selected the contract of RHP Wilmer Font from Oklahoma City Dodgers. February 26, 2017 RHP Wilmer Font assigned to Los Angeles Dodgers. January 12, 2017 RHP Wilmer Font assigned to Oklahoma City Dodgers. December 21, 2016 Los Angeles Dodgers signed free agent RHP Wilmer Font to a minor league contract. November 7, 2016 RHP Wilmer Font elected free agency. October 2, 2016 RHP Wilmer Font assigned to Leones del Caracas. July 25, 2016 RHP Wilmer Font assigned to New Hampshire Fisher Cats from Buffalo Bisons. July 8, 2016 RHP Wilmer Font assigned to Buffalo Bisons. 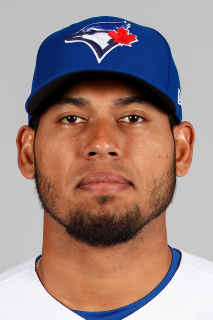 July 7, 2016 Toronto Blue Jays signed free agent RHP Wilmer Font to a minor league contract. October 7, 2015 RHP Wilmer Font assigned to Leones del Caracas. March 30, 2015 Louisville Bats released RHP Wilmer Font. December 7, 2014 RHP Wilmer Font assigned to Louisville Bats. November 30, 2014 Cincinnati Reds signed free agent RHP Wilmer Font to a minor league contract. October 6, 2014 Texas Rangers sent Wilmer Font outright to Round Rock Express. October 2, 2014 Texas Rangers designated RHP Wilmer Font for assignment. September 29, 2014 Texas Rangers recalled RHP Wilmer Font from Frisco RoughRiders. September 23, 2014 Frisco RoughRiders activated RHP Wilmer Font from the 7-day disabled list. August 10, 2014 Frisco RoughRiders placed RHP Wilmer Font on the 7-day disabled list. August 5, 2014 Frisco RoughRiders activated RHP Wilmer Font from the 7-day disabled list. July 8, 2014 Frisco RoughRiders placed RHP Wilmer Font on the 7-day disabled list. March 26, 2014 RHP Wilmer Font assigned to Frisco RoughRiders from Round Rock Express. March 12, 2014 Texas Rangers optioned RHP Wilmer Font to Round Rock Express. October 22, 2013 RHP Wilmer Font assigned to Leones del Caracas. October 2, 2013 Wilmer Font roster status changed by Texas Rangers. July 18, 2013 Texas Rangers optioned RHP Wilmer Font to Round Rock Express. July 11, 2013 Texas Rangers recalled Wilmer Font from Round Rock Express. June 29, 2013 Wilmer Font assigned to Round Rock Express from Frisco RoughRiders. March 28, 2013 Wilmer Font assigned to Frisco RoughRiders. March 19, 2013 Texas Rangers optioned Wilmer Font to Round Rock Express. October 11, 2012 Leones del Caracas activated RHP Wilmer Font. October 7, 2012 Wilmer Font roster status changed by Texas Rangers. September 16, 2012 Texas Rangers recalled RHP Wilmer Font from Frisco RoughRiders. August 1, 2012 Wilmer Font assigned to Frisco RoughRiders from Myrtle Beach Pelicans. March 15, 2012 Texas Rangers optioned Wilmer Font to Myrtle Beach Pelicans. November 2, 2011 Wilmer Font roster status changed by Texas Rangers. October 10, 2011 RHP Wilmer Font assigned to Leones del Caracas. August 31, 2011 Texas Rangers recalled RHP Wilmer Font from Myrtle Beach Pelicans. April 8, 2011 Wilmer Font roster status changed by Myrtle Beach Pelicans. March 12, 2011 Texas Rangers optioned RHP Wilmer Font to Myrtle Beach Pelicans. November 19, 2010 Texas Rangers selected the contract of Wilmer Font from Bakersfield Blaze. October 4, 2010 Wilmer Font roster status changed by Bakersfield Blaze. July 9, 2010 Bakersfield Blaze placed RHP Wilmer Font on the 7-day disabled list. May 17, 2010 RHP Wilmer Font assigned to Bakersfield Blaze from Hickory Crawdads.